Only 1/4 of the nine inch pie pan. The 1 year old had already eaten and the 3 year old only had a small piece. This is your warning, make a lot if you plan to eat this. This lonely leftover piece is already packed away for my husband to take to work tomorrow, he mentioned something about bragging and showing it off. This is not a typical pie crust, I was hoping for a flaky biscuit crust but this is more like a drop biscuit crust. You can use a different crust if you have a favorite but this one is tasty. I have hopes of making lots of other things with this crust. This recipe was not difficult but it does use a lot of ingredients and a lot of different steps. Hopefully you can keep up with the insanity that follows. Add all veggies. If any of the veggies have already been cooked you can add them near the end of the cooking time. Cook until all veggies are tender then remove from heat. In a large mixing bowl add dry ingredients together and mix well. Cut in Earth Balance until small pebbles will form. Add in milk 1/4 cup at a time. Only use as much as you need. The dough will be very wet. Spray pie plate with cooking spray. 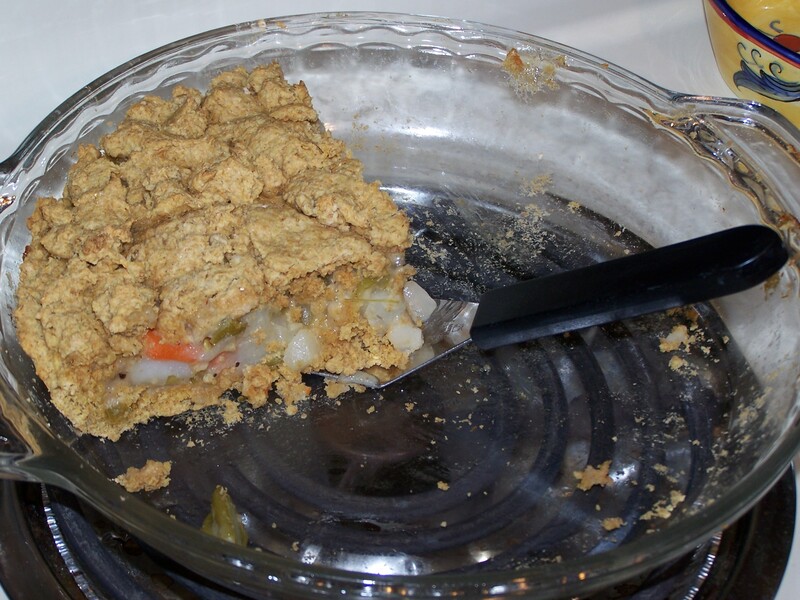 Using your hands spread a little more than half of the dough in the bottom of the pie plate and along the sides. 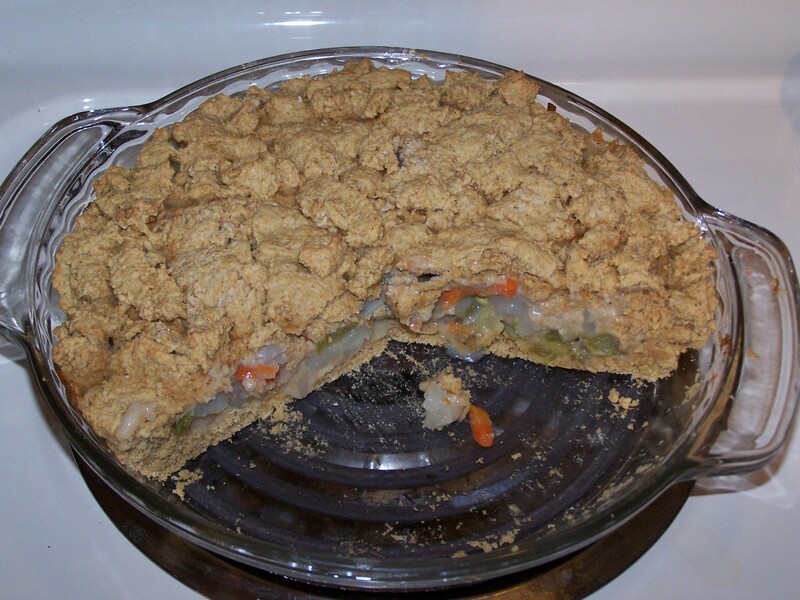 With a slotted spoon scoop cooked veggies into pie plate. I cooked a lot more veggies that I needed but they will be a nice little addition to another meal later. Pour the Easy All Purpose Sauce (the recipe is below) on top of the veggies. Using your hands spread the remaining dough onto the top of the pot pie. Try to use as small amounts as possible, don’t worry if there is not enough. Bake in the oven for 15 minutes. The crust will be golden brown. Heat Earth Balance in a small sauce pan, on medium heat, until melted. Whisk in corn starch (or flour). Once a roux starts to form slowly add liquid 1/4 cup at a time, stirring constantly. If the sauce is too thin add a small amount of corn starch, if it is to thick add a small amount of more liquid. This sauce is poured over the veggies in the pot pie, but this is an incredible versatile sauce and really deserves it’s own post describing it’s awesomeness. Maybe next week I’ll tell you how to use it’s base as a gravy, or a pasta sauce, or…. I know that I am weird but I didn’t miss the meat, although I kept typing “chicken pot pie”. I cut the veggies big so that there was a nice texture and something to chew. You can use any veggies you like in this. If you’re transitioning off of meat this is a great recipe. You could add a small amount of chicken and use chicken broth and your family would feel like they are getting a meaty meal. 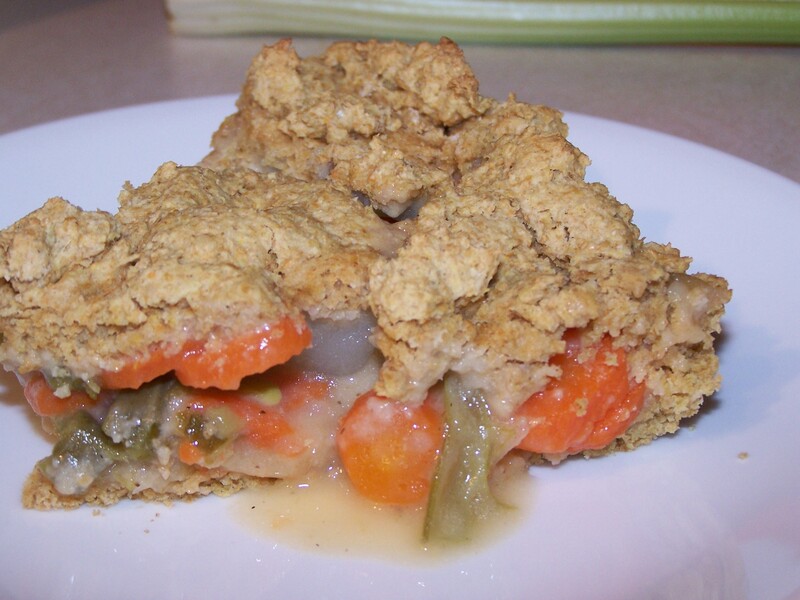 If you don’t have a lot of time you could use frozen veggies and a pre-made pie crust. The sauce takes less than 10 minutes start to finish, but it does take constant attention. I would not recommend using canned sauce as most of them have MSG or other unsavory ingredients. In your journey to eat healthier you can’t get caught up in every little detail. I used fresh veggies but they important thing is that your family is eating veggies. Even small steps are steps in the right direction. My 3 year old didn’t want to eat his carrots so we all ate carrots at the same time. Next time I will add 1 tsp garlic powder, 1 tsp onion powder and 1/2 tsp more salt to the crust, maybe even some nutritional yeast. I’m also thinking of a spicy meal, maybe a Taco Pot Pie using my Lentil Taco’s Recipe. This is exactly the type of recipe I’ve been looking for! Thank you for saving me the time and effort of converting the tastey, yet unhealthy version of the traditional potpit recipe! Sherry, I’m glad you found it! It is very easy too, despite the long list of steps. Last night I ate the leftover veggies with the leftover sauce, it made a fantastic soup. We have made this several times now and our whole family has been enjoying it- thank you! Hi Leah, I am so glad! I’ve been wanting to make it lately, maybe it will make it onto the meal plan this week!